When the distillery was built in 1892 it was outfitted with second hand still from Lagavulin and Glen Albyn. This might seem a bit odd at first, but the use of second hand stills from other distilleries that were demolished or refurbished is actually not that uncommon. These days Balvenie has no less than eight stills (4 wash stills and 4 spirit stills); two of them were added in 1965 and one in 1971.
than a century later they are still 'sister stills', owned by the very same company that originally built them; William Grant & Sons. The official Balvenie core range includes the standard 10 years old 'Founders Reserve', the 12 years old 'DoubleWood', the 15yo 'Single Barrel' and the 21 year old 'Port Wood'. Actually, that's just the 'core' core range - the 25year 'Single Barrel' is a fairly regular release and bottlings like the 1989 and 1991 'Port Wood' and the 17yo 'Islay Cask' were available for a longer period of time as well. 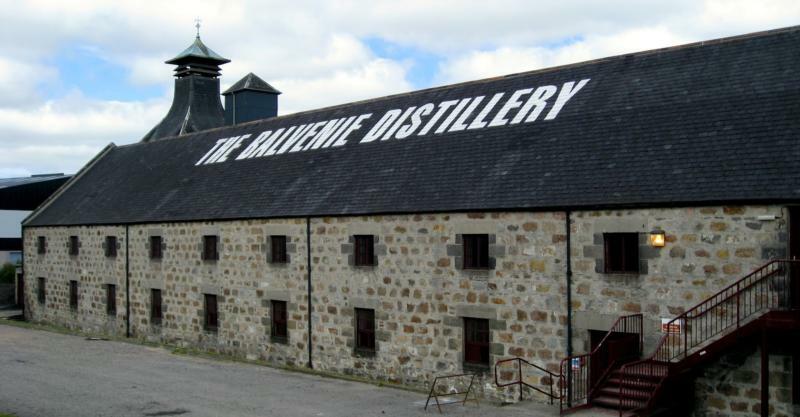 Balvenie also provides a fine example of the irrelevance of the 'terroir' theories on Scotch whisky in modern times. Balvenie and Glenfiddich are neighbours and use the very same water source. Nevertheless, the malt whiskies they produce are quite different from each other.
" NOSE: Elegant and complex with oak, vanilla, honeyed sweetness and a hint of green apple. TASTE: Sweet with dried fruits, sherbet spice, toasted almonds and cinnamon, layered with a richness of creamy toffee notes, traces of oak and deep vanilla. FINISH: Vanilla, oak, honey and a spicy sweetness.